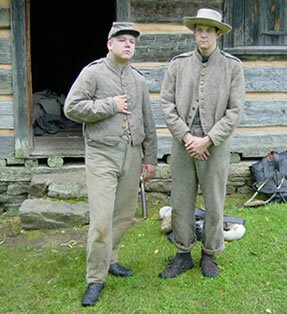 One of the most important facets of being a reenactor is the look or "impression" you attempt to portray of the individuals you seek to emmulate. With this in mind we have prepared guidelines to aid members in preparing and implementing a quality impression. For both the CS and US Impressions it is required that all members adhere to and consult our Standard Operating Procedures (SOP's) and your assigned "mentor" from the Authenticity Committee before making any purchases. The following is a basic list of uniform parts and equipment that you will need as a member in the 26th NC. All items need to be purchased from the Authentic Equipment Links Vendor List, found elsewhere under the Uniform and Equipment page. Follow the links below to see our guidelines. SHELL JACKET - The 26th NC Regt. required uniform jacket is the Richmond Depot Type II. This can only be purchased from sutler Ben Tart as he is the only authorized vendor for this product. The color will be 1FB (Oxford on Brown) and it made of jeans cloth material. Allow six weeks for delivery and it is advisable that you go up one size from your regular suit coat size to allow for growth and comfort. TROUSERS - These should also be purchased from Ben Tart, as he is reproducing a very nice North Carolina pattern pair of trousers. These will be of a different color of jean cloth. Patterns may include either military or civilians styles. SHIRTS - This will be "pull-over" type of shirt, usually with a three to four button placket enclosing the front. The buttons need to be made of wood, bone or glass. Colors may vary from white to period correct civilian patterns. BROGANS and SOCKS - You MUST wear the proper footwear from an approved source. Generally we recommend that you purchase a pair of *US Brogans as this shoe could work for both the CS or US impressions. The socks must be correct as well. There are CS *Cotton Socks available from sutler Ben Tart and hand-made *wool socks that can be purchased from 26th NCT member, Al Leonard. HATS - It is recommended that you purchase a nice civilian slouch hat first. There are great ones out there and there are not so great ones. Don't go cheap - buy a first rate hat and you will never regret it. The proper slouch hat should include the following criteria: nice wool or beaver felt, leather sweatband, proper lining and trim on the brim. Please check the approved vendor list for the names of the sutlers we recommend. Once you have made this purchase, then a quality kepi (or forage) would be a nice addition to your impression. There are big differences in a nice kepi and a cheap one. There should be a leather sweatband and proper lining on these hats. Again check the approved vendor list. EYEGLASSES - Nothing will ruin a good impression quicker than a pair of modern glasses. It is therefore requiredthat if you wear glasses that you do one of three things: a) purchase a pair of period frames and have your prescription placed in them, b) wear contacts or c) go without. There are Antique Eyeglass Vendors listed on the approved vendor list. OTHER CLOTHING OPTIONS - It is up to the individual whether or not to purchase a Greatcoat or vest. If one decides to purchase a greatcoat, which are really nice to have in the winter months, then we recommend the *US Greatcoat as it can be used for both CS and US impressions. Your choices for a vest are: a CS or *US military vest and a *civilian vest. Please make sure and consult the approved vendor list for both items. ACCOUTREMENTS - It is acceptable to purchase the items from the Federal list first to make the best use of those items suitable for dual use. It is recommended however, that you purchase a black, CS roller-buckle belt or Georgia frame at the same time as these were more representative of belts worn by Confederate Troops. As the NC or CS oval plates were very rare in the Army of Northern Virginia, we do not include them in our list of belt plate options. See the approved vendor list for suppliers. Once you have made these purchases, then you may want to consider buying a set of CS leathers for a strictly CS impression. You could as a third choice go with an imported set of leathers such as the British made items. Feel free to consult with any member of the Authenticity Committee for recommendations. HAVERSACK - Your food should be carried in this. There are basically two choices in this category - CS Linen or *US Tarred. You should also purchase some smaller, cotton ration bags to place your food in as well as some modern small items. Though usage of US haversacks are allowed, members are encouraged to purchase CS haversacks when practicable. CANTEEN - There are four choices that will work here. The CS tin or wooden canteen (Gardner pattern only) or the *US 1858 Smoothside With brown jean cloth cover and brown leather strap or *US 1862 Bullseye with brown jean cloth cover and white canvas strap. Though usage of US canteens is allowed, members are encouraged to purchase CS canteens when practicable. *TENT - Buy the Shelter-half first. This is the required tent for the 26th NCT. Options include either a Federal Type IIa or IIb with handsewn grommets. ABSOLUTELY NO BRASS GROMMETS. Since more of our events are falling into the "campaign-style," you will need this. Most people buy the two halves, thus they have a complete tent. An A-Frame is acceptable only after you have purchased the Shelter tent and should only be used when we are in a "garrison camp." BLANKETS - There are several choices that you can choose from: the *US 1851 Gray blanket with dark gray end stripes, the NC pattern blanket, the *US 1862 Brown blanket with dark brown end stripes, or a period-style made quilt. GROUND CLOTH - A good ground cloth is a must. This is what protects you from the wet environment and gives you some separation from the ground. Options include a Federal issue gum blanket or poncho or a period correct oil cloth. BLANKET ROLL and/or KNAPSACK - You will need a way to carry your gear and will have to either select to do so by creating a blanket roll or purchasing a knapsack. A blanket roll is simply taking your ground cloth and blankets and rolling them up into what looks like a "horse-collar." In this roll you could place an extra pair of socks and a shirt if needed. There are several choices for the knapsack ranging from the CS Single Bag to the *US Double Bag. There are "Hardpacks" and "Softpacks" available though the "Hardpacks" were typically used in the early war stages and tended to be less comfortable than the "Softpacks." MUSKET - The top three choices are: (in no particular order) a) 1842 Springfield, 1853 British 3-band Enfield, and the 1861 Springfield. A good CS version of the '61 Springfield is the CS Richmond, though this will restrict your impression. You MAY NOT use a 2-Band Musket or Shotgun and only officers may carry pistols. BAYONET - You must purchase a bayonet that fits your musket. It is probably a good idea to take your musket with you when purchasing your bayonet to ensure a proper fit. 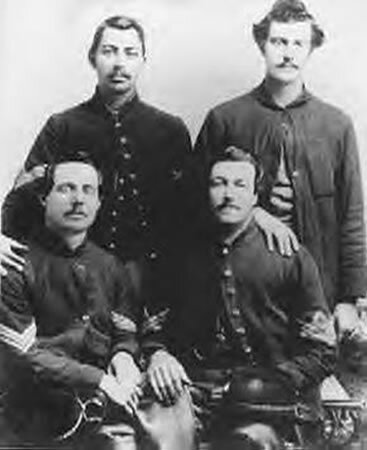 The 24th Michigan Volunteers was a member of the famed Union Iron Brigade. This unit, along with the rest of it's Brigade faced the 26th NCT and Pettigrew's NC Brigade during the first days fight at the Battle of Gettysburg on July 1, 1863. For this reason, we chose the 24th Michigan Volunteers as our Federal Impression. 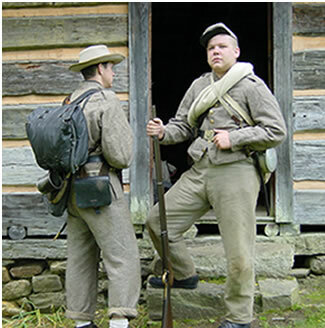 One unique item in portraying members of the original Iron Brigade is their choice of uniform. It was John Gibbon, a former Regular US Army officer and who originally commanded the Iron Brigade that decided that the troops under his command would wear the uniform of the pre-war US Army. 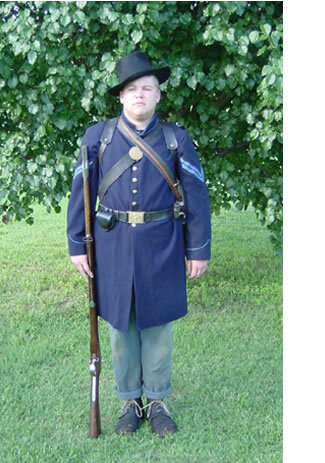 That being the 1858 US Hardee Hat and a Enlistedman's Frock Coat. It is our recommendation that the Hardee Hat's not be "dressed" meaning that there should be no hat brass, cords of feathers. 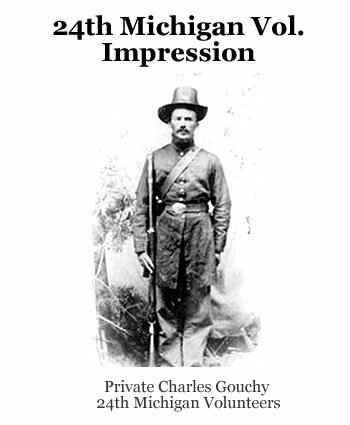 According to most of the images that exist from members of the Iron Brigade, most are "undressed." NOTE: The items listed here are what is required for your Federal Infantry impression. 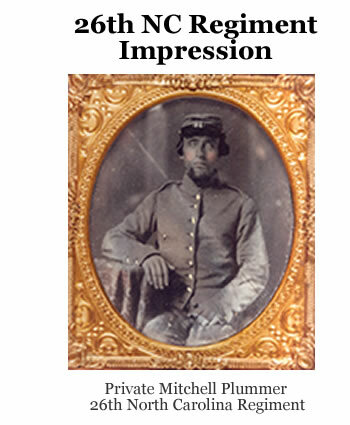 Some items previously purchased for your Confederate Infantry impression will be acceptable for your US impression as well. The items listed with a red astrick (*) indicate US / CS usage. UNIFORM COATS - We recommend that each member purchase a US Enlistedman's Frock Coat. A second choice is the US Sack Coat (lined only). TROUSERS - The required trouser is the US Enlistedman’s Infantry "Sky Blue trousers." HATS - We recommend that each member purchase the 1858 US Hardee Hat but to keep it undressed. A second choice would be to purchase a US Forage Cap. SCABBARD - US M1859 two rivet or US M1863 seven rivet bayonet scabbard and frog. NOTE: make sure that you order a scabbard that fits the bayonet for your chosen musket. HAVERSACK & CANTEEN - US Regulation Haversack and M1862 bullseye canteen with brown jean cover and linen sling. 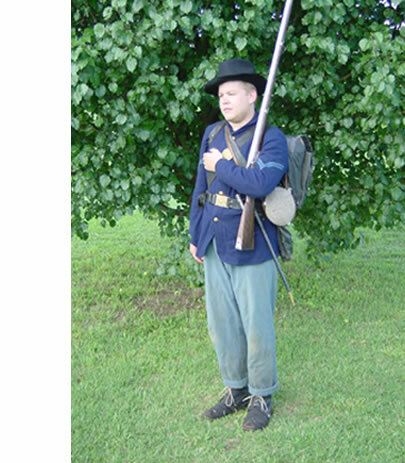 KNAPSACK - The US Infantry knapsack used during the Civil War falls into two different models. The US M1855 and the US M1864. Both are similar in design, consisting of two compartments that fold on one another with the greatcoat or blanket secured on top by two straps.